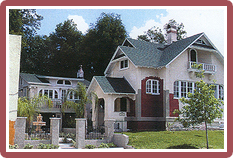 DeLand, incorporated in 1882, is located in Central Florida atop the worn ridges of the Appalachian Mountains. Although surrounded by numerous tourist destinations - Daytona Beach, NASCAR, Cape Kennedy and Disney World - this charming community was a well-kept secret until recent times. Even Interstate 4, constructed in the 1960's ignored DeLand, connecting Daytona Beach with the inevitable boom of the Mouse and his accompanying attractions. Only a few years ago developers, running short on land along the coast and in metropolitan areas, discovered DeLand. But it wasn't just land speculators who stumbled into town, it was also tourists rejecting interstate travel. 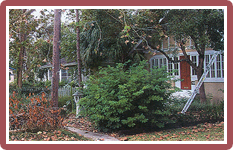 And DeLand's tree-lined streets and quaint buildings beckoned many of them back, permanently. 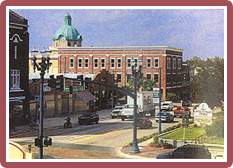 DeLand is a mix of new homes and revitalized neighborhoods. The town contains hundreds of historic properties, many in various stages of restoration. 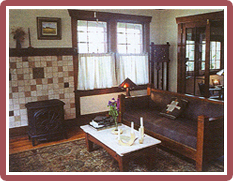 Its oldest houses are Victorian, but in the early 1900s many northern pioneers brought with them new architectural designs. 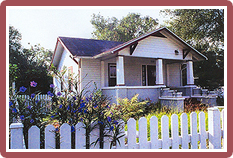 It was the bungalow that took hold then, transforming DeLand into a community of affordable, efficient and practical homes. The resurgence of interest in the Arts and Crafts movement has recently returned the focus of attention to these once taken-for-granted homes, causing a bungalow buying frenzy. When a bungalow goes on the market, usually within days it's under contract with multiple backup offers. 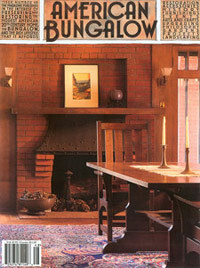 The bungalow phenomenon is the most recent chapter in a redevelopment chronicle that goes back more than two decades. A turning point came in 1985, when downtown DeLand was listed on the National Register of Historic Places. It also became a part of MainStreet, the nationally acclaimed conservation program established to promote revitalization of America's downtowns, and was the first city in Florida to receive that designation. "For five years DeLand has been voted the best Main Street in Florida", boasts Taver Cornett, MainStreet DeLand's executive director. "We went from a dead downtown in the '80s to 100-percent occupancy, thanks to our MainStreet Program." 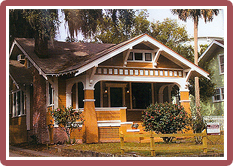 In the 1900s, DeLand established a residential historic district in the northwest sector adjacent to downtown, across the street from the nationally acclaimed Stetson University, which is also listed on the National Register of Historic Places. These events encouraged property owners to begin restoration of their buildings, including the bungalows. I'm a realtor, and a little more than three years ago I began DeLand's newest residential revitalization project, "The Garden District." Near downtown, the crumbling crime-ridden neighborhood included more than 100 buildings, many of which were bungalows. These structures were boarded up, and trash was piled high. 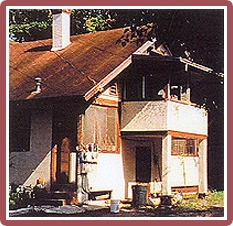 I began a full-time effort to list and sell these properties for restoration. California developer Michael Arth read about the project, moved to DeLand and bought 19 houses in what was once called "Crack Alley." Today more than a dozen investors have purchased 50-plus buildings. This redevelopment effort now includes a tearoom, museum, art gallery, real estate office and veterinary hospital. The project incorporated landscaping, streetscapes and signage. I'm happy to say this work in progress is transforming a once ugly and unsafe neighborhood into an attractive, pedestrian-friendly place to live, work and play. Hernando Gomez, a new resident I lured to DeLand, has had passion for bungalows since buying his first dilapidated one, painstakingly restoring it, then moving in a year later. As an architect, he believes that "my role as a professional goes beyond just providing consulting services in the community; it should also include taking positive action, teaching a town the value of its bungalows." Now a good friend, Gomez lives his philosophy. He's systematically creating an inventory of bungalows that includes houses dating back to the mid-1890s. He's also involved in an annual workshop organized by the historical society to assist others in restoration projects. "The idea is to give people a comfort level with their projects and to raise the quality of the end products," he says. I also believe my own role is bigger, and that a realtor must do more than sell houses. Selling's easy; it's getting a perfect match with house and buyer that's so important, especially when dealing with historic structures. My love affair with old building dates back to the years I spent growing up in a Foursquare Sears kit house. 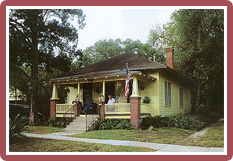 I've personally renovated three bungalows in DeLand, including my real estate office and a veterinary hospital for my daughter. 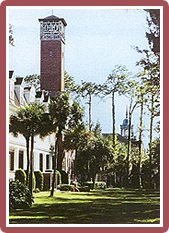 My work in the Garden District has nothing to do with a commission; it's all about a mission. I look at it as leaving a legacy to my grandchildren and to our town. My fellow DeLandites are determined to protect their cultural history. There is an initiative to extend the boundaries of downtown to infuse life back into worn neighborhoods. The historical society annually offers an "Old House Restoration Workshop" to educate property owners, and the city and the Garden District Homeowner's Association are working to bring residential living back into downtown. 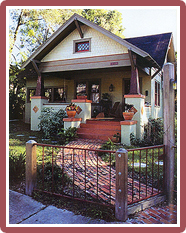 Plus, the Central Florida Bungalow Association, co-founded by Hernando and me, is promoting the Arts and Crafts movement and its buildings in DeLand and surrounding communities. "We want to share resources and experiences with others who love this type of house," says Hernando. With all that's happening in town today, founding father Henry A. DeLand would be pleased. He took great care and invested personal funds in developing his city. With restoration efforts in progress on literally hundreds of bungalows, coupled with the city's efforts to revitalize its old neighborhoods, the protection of historic Stetson University and the MainStreet Program, DeLand still holds claim to its founder's title, "The Athens of Florida." 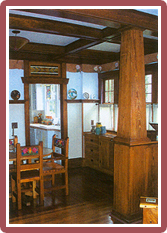 The Good: Much of the original woodwork was intact and restorable but in need of stripping and refinishing. The heart-of-pine kitchen floor was salvageable. 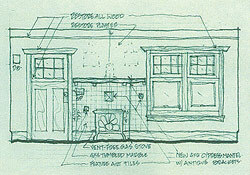 The layout of the house was very functional. 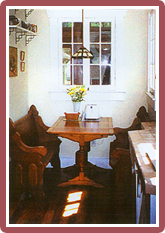 Only the second floor, which housed two families when we bought it, needed to be reconfigured. 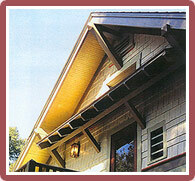 Hence we considered our project a significant restoration with some remodeling on the second floor. The Bad: Unattractive additions needed removing, including a second-floor sleeping porch. The staircase needed rerouting back to its original configuration, having been changed to accommodate the creation of an upstairs independent apartment. The Ugly: The house needed tenting due extensive termite infestation and the structural framing was seriously compromised. The damage along the southeast corner required an 8' x 10' sill beam be replaced, which in turn necessitated jacking up the house and keeping it up in the air for several days. The resulting work was enormously satisfying, though. Repairs to outriggers, brackets and moldings required special milling and we had to use old salvaged wood when repairing one of the doors. 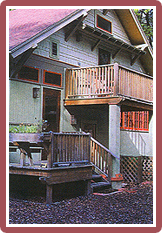 The enclosed, tacked-on sleeping porch was removed and reconfigured as an open balcony and the garage shed porch replaced with an open front deck. 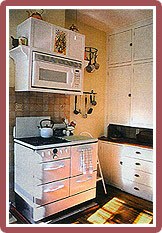 For the kitchen we decided on modernization that would respect the original kitchen as much as possible. We removed an old linen closet and the furnace chimney to make room for the refrigerator and opted for a 1930s stove bought on eBay. We contracted most of the project, but I did the wood refinishing myself. It took three stains: one for the old wood, a second one for the new wood and a third one for patches, to achieve uniformity. Even though my wife, Barbara, and I had never been Arts and Craft collectors we have become so, acquiring items at auction including artwork, pottery and furniture. Our home also includes items from years of living and traveling throughout Latin American that seem a perfect fit for our "new" old home. 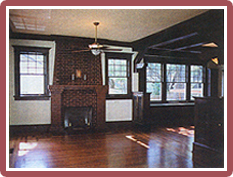 My second project was a real find - a gem of a 1921 Sears kit house, "The Belmont." Thankfully, this home had very little deterioration. It was brought back to life with simple things - repairing window weights and replacing hardware that no longer worked, for instance - and a bit of hard work. There is so much available information, particularly through the Internet, that it was possible to address the basic issues of restoration. The colors, for instance, are the ones suggested in the original catalogue sheet. 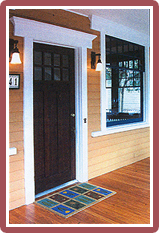 The only portion of the exterior that was not original was the enclosed porch in the back with unfortunate aluminum windows and steel doors. This posed a dilemma: short of removing the addition, the original condition was unachievable, so we left the windows in place but adjusted the siding to match the rest of the house. Eventually, it would be nice if new wood windows and doors could be installed. We did play with the idea that the house - like our other recent restoration project, the Rohde House - had to meet 21st-century living requirements. So all services, including Internet connectivity, were built in. The house was recently purchased by a couple from Georgia who own a bed and breakfast and are planning to move to Florida.